The 50mm T1.5 VDSLR AS UMC Lens for Canon EF Mount from Samyang is a fast, manual focus, prime lens. 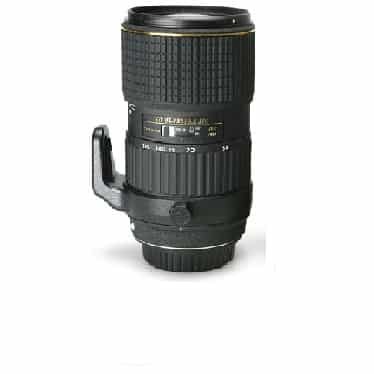 It provides a maximum aperture of T1.5 for effective low light capture and shallow depth of field control and an 8 blade iris for attractive bokeh. 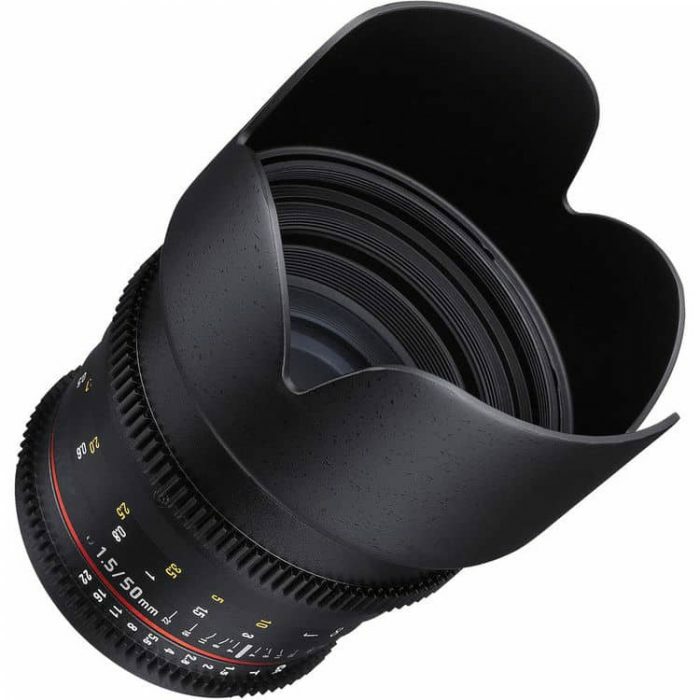 Optimized for cinema and video applications, the focus and aperture control rings are outfitted with industry standard gearing, which provides an interface for working with a traditional follow focus. The aperture control ring has also been de-clicked, which enables smooth iris pulls. In addition, bright aperture and distance markings are printed on the lens barrel facing laterally to facilitate easier control by a focus puller. 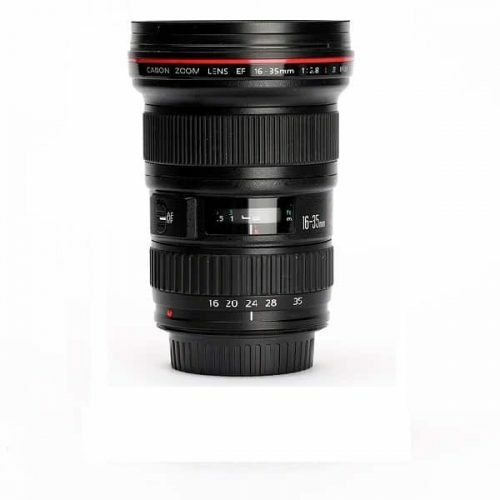 The 50mm has a minimum focus distance of 1.5′. Internal focusing minimizes the effects of lens breathing, which insures a more consistent angle-of-view when adjusting focus. The lens is composed of 9 elements in 6 groups, including one aspherical element and one hybrid aspherical element to reduce aberrations. In addition, a lens multi-coating helps to improve light transmission reducing flare and ghosting. The filter thread diameter is 77mm. 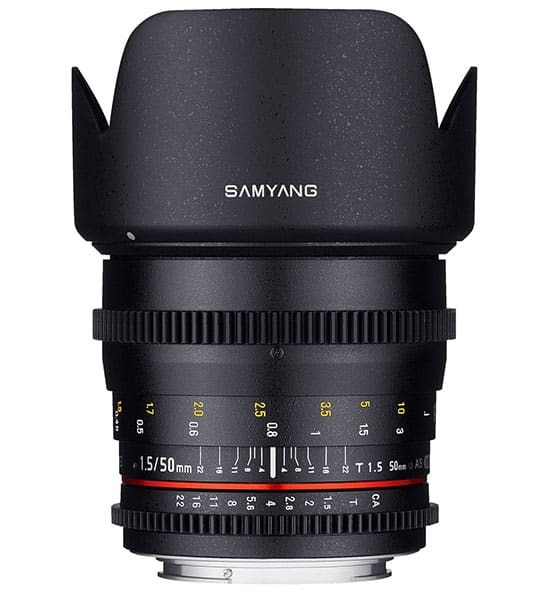 The VDSLR line of cinema lenses unifies Samyang’s cine lenses into a cohesive series. Each of the VDSLR lenses will offer the same alignment of their geared focus and aperture rings so that follow focus and other rig accessories won’t need re-adjustment when swapping lenses. 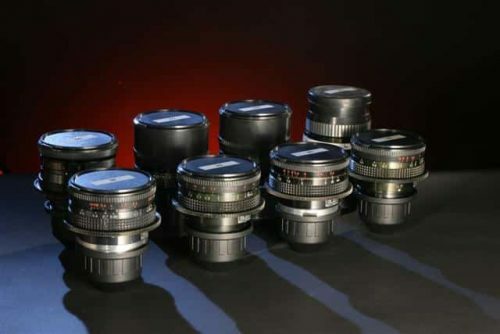 Also, each lens is tested to be color matched with the other lenses in the series and provide the same color and contrast when shooting video. Lastly, the lenses are marked with focusing scales on each side of the barrel for easier adjustment from both sides of the camera. 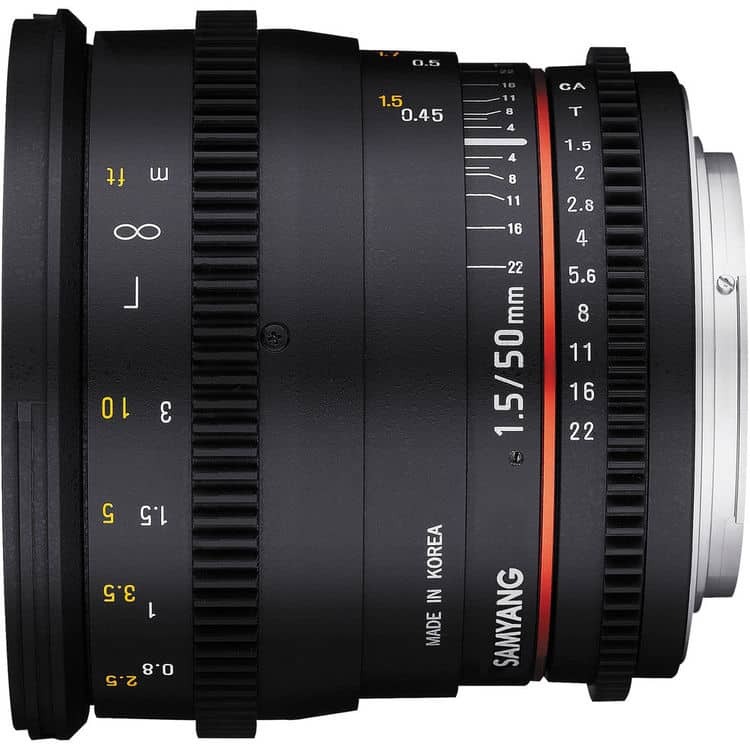 Functional as still photo lens but optimized for cinema and video shooting with geared aperture and focus rings, de-clicked aperture for smooth exposure transitions, and side-facing aperture and distance markings. 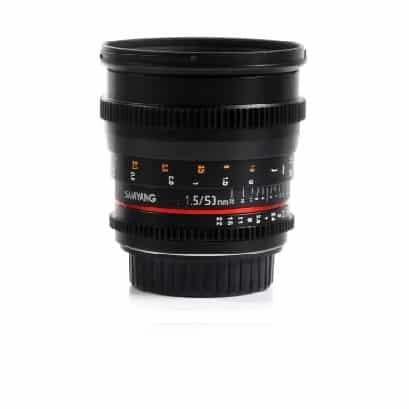 The 50mm T1.5 is part of the VDSLR series of cine lenses, sharing characteristics and features that unify the series and make it easier for users to swap out lenses when shooting video. 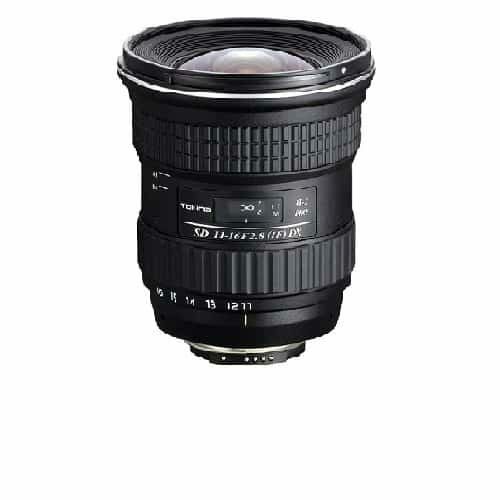 Each VDSLR lens provides aligned focus and aperture rings so that readjustment of the follow focus is not necessary when switching lenses. Also each lens has been tested to match color and contrast for a consistent look and less potential post-processing. Finally, all lenses from this series print focus scales on both sides of the lens barrel for ease of use from each side of the camera.